My minicomic Phase 7 is a very bare bones zine. I try to keep it very simple so that I can spend more time working on the comics. 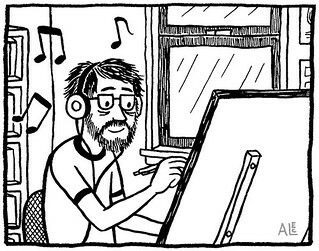 I’m currently working on a three issue autobio story called “Weezer Fan.” It describes my experiences being obsessed with Weezer as a teenager, then growing up listening to them and eventually getting to meet and work with the band. 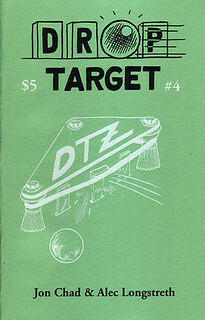 I’m also working on a pinball zine with my buddy Jon Chad, called Drop Target. Jon is a bookmaking wizard, so this zine has a lot more bells and whistles. Each issue sports a two color screen-printed cover, plus a full color center spread that folds out. We cover all things pinball… reviews of pinball movies and books, tips for improving your game or how to fix machines, walkthroughs of games to help you beat them, autobio comics about our experiences playing pinball, interviews with pinball community members (players, designers, operators, etc. ), we even make up our own “dream machines” that we wish existed. You name it – if it has to do with pinball – it’s in Drop Target! In my studio AKA my living room. I work from home, so I draw everything at my drafting board and do all the pre-press work with a scanner and my computer. In this kind of scenario it’s very important to leave the apartment at least once a day, so I got a P.O. Box at a post office about a mile away. That’s my little outing each day, up to the post office box, to see if I got any cool new zines in the mail! King-Cat Comics and Stories by John Porcellino, I Swallowed the Key to My Heart by Liz Prince, Invincible Summer / Clutch McBastard splits by Nicole Georges and Greg Means. Get started! The best thing about zines is that there are no gatekeepers. No one can tell you what you can or can’t do. If you have an idea, get it down however you can – draw it, write it, type it up and print it out, photocopy it, collage it – and then get yourself to a copy shop or your local library or school, or anywhere with a photocopier. That first zine is the hardest one to make, but once you figure out the pagination, you’re off to the races! My favorite thing about zines is that it gives every person the opportunity to be heard. It’s a cheap, fast way to share your thoughts and stories with other people. I’ve been drawing my minicomic Phase 7 for ten years now, and I think my favorite thing about it is that it keeps me in touch with all of my friends. At least a few times a year they’ll get something from me in the mail, and it gives us an excuse to check in with each other and see how the other one is doing. Learn more about Phase 7 Comics on Alec Longstreth’s website!